Welcome to Music Friday when we bring you romantic throwback tunes with jewelry, gemstones or precious metals in the title or lyrics. In Tom Jones's soaring rendition of “I (Who Have Nothing),” the Welch crooner assumes the role of a poor man trying to win the heart of his true love. While his rival has the means to buy her diamonds, all Jones can offer are the words, "I love you." He sings, "He, he buys you diamonds / Bright, sparkling diamonds / But believe me, dear when I say, / That he can give you the world, / But he’ll never love you the way / I love you." The passionate young man professes his love, but it's not enough. The song ends with Jones's character — nose pressed against his window pane — painfully watching his love "go dancing by wrapped in the arms of somebody else." Written by Jerry Leiber and Mike Stoller, "I (Who Have Nothing)" has been covered by dozens of artists, both male and female, for the past 55 years, but the version that rises above the rest is performed here by Sir Thomas John Woodward (better known as Tom Jones). His powerful interpretation elevated the song to #14 on the Billboard Hot 100 chart in 1970. The first artists to hit the airwaves with “I (Who Have Nothing)” were Ben E. King and Shirley Bassey, both in 1963. Since then, the song has been covered by singers as diverse as Petula Clark, Luther Vandross, Liza Minnelli and Neil Diamond. Interestingly, "I (Who Have Nothing)" was derived from an Italian song called "Uno Dei Tanti," which translates to "one of many" in English. Joe Sentieri released the Italian version in 1961. Jones, whose soulful voice and great looks melted hearts during the 1960s and 1970s, has sold more than 100 million records and charted 36 Top-40 hits, including “It’s Not Unusual,” “What’s New Pussycat” and “Delilah.” He's still touring at the age of 78. We invite you to enjoy the video of Tom Jones performing “I (Who Have Nothing).” The lyrics are below if you’d like to sing along. Written by Jerry Leiber and Mike Stoller. Performed by Tom Jones. 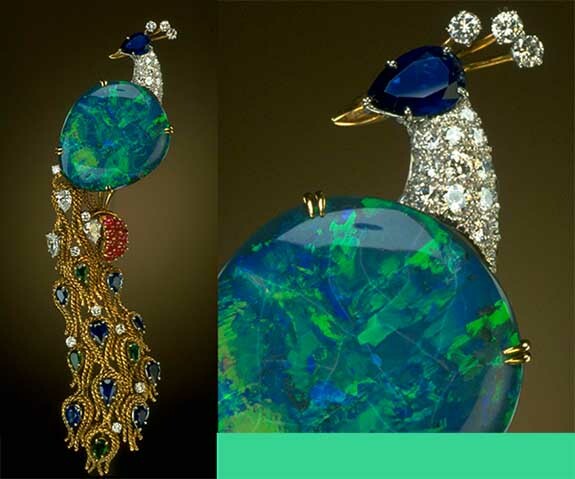 Gifted to the Smithsonian in 1977 by legendary jeweler Harry Winston, the "Opal Peacock" brooch showcases a 32-carat black opal sourced from Lightning Ridge, Australia. The cabochon-cut gem, which displays a vivid blue and green play-of-color reminiscent of a peacock's plumage, is considered one of the world's finest examples of October's birthstone. Interestingly, an opal's silica structure contains 3% to 20% water, according to the American Gem Society. Inspired by the constellations that light up the night sky of Canada's remote Northwest Territories, "The Diavik Stars of the Arctic" will headline Rio Tinto’s upcoming "Specials" tender — a showcase of rough diamonds greater than 10.8 carats. Among the diamonds comprising The Diavik Stars is the 177.71-carat "Vega of the Arctic," one of the largest and most valuable gem-quality rough diamonds ever produced at Rio Tinto's Diavik Diamond Mine, which is located just 136 miles (220 km) south of the Arctic Circle. A second standout is the "Capella of the Arctic," a dazzling yellow diamond that weighs 24.82 carats. 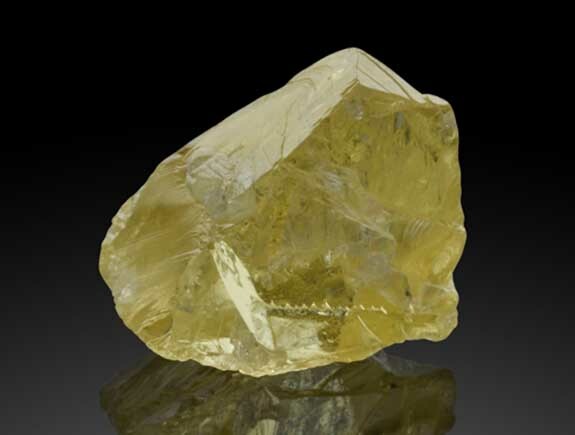 Rio Tinto reports that this yellow diamond is extraordinarily rare because the mine, on average, delivers only five of these diamonds each year. That translates into less than 0.001% of its annual production. 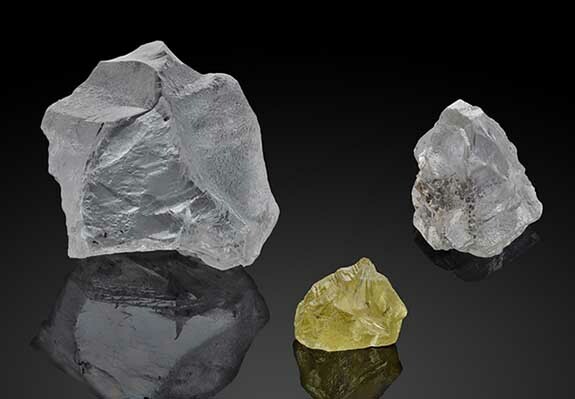 The 59.10-carat "Altair of the Arctic" rounds out the trio of fabulous gems which, as a group, underscore the rare combination of size, quality and color being produced by the Diavik Diamond Mine. 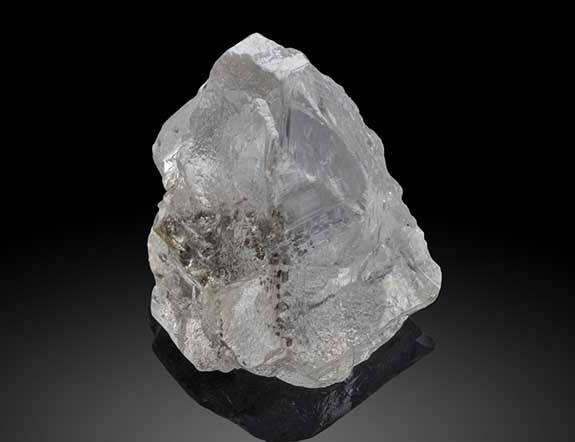 The Diavik Stars of the Arctic will be exhibited in the diamond centers of Antwerp and Israel before bidding closes on October 25. Astronomy buffs will recognize that the Vega, Capella and Altair diamonds share their names with some of the brightest stars in the night sky. 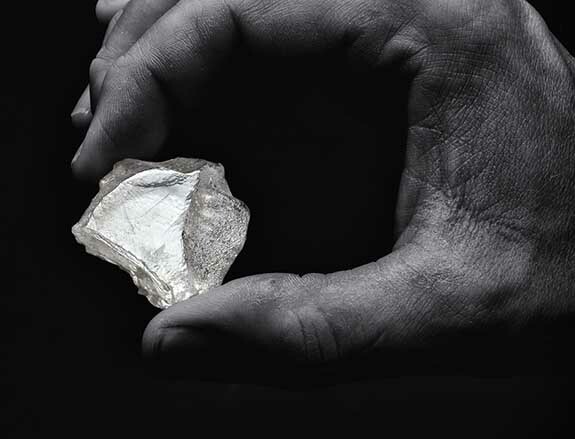 According to Rio Tinto, the Diavik Diamond Mine produces predominantly gem-quality diamonds destined for high-end jewelry in all major consumer markets around the world. The mine, which began production in 2003, is jointly owned by Rio Tinto (60%) and Dominion Diamond Mines (40%).